Sometimes seeing spots is actually a good thing. Looking to tie dye T-shirts without making too much of a mess? 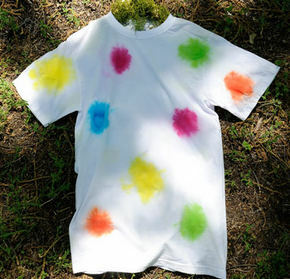 The Lots o Dots Tie Dye T-Shirt is a super easy tie dye project that kids will love to make. Kids can create the funky tie tye design effortlessly, which means this DIY T-shirt makes a great summer craft for younger kids to try. This is one cool tie dye idea that you won’t find anywhere else. Wash T-shirt without fabric softener and do not dry. Cover work surface with plastic tablecloth. Lay damp tee on prepared work surface. Position ping pong balls randomly under shirt and secure each with a rubber band or Tulip® zip tie. Mix dye colors according to package instructions. Apply dye colors randomly over each ping pong ball. Cover tee with plastic tablecloth and let dye set 6-8 hours. Rinse tee under cold running water to remove excess dye. Wash tee according to package instructions. Remove zip ties or rubber bands and dry tee in dryer.